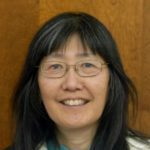 This March/Rally for Science has been posted on our Calendar for weeks, evolving from a march from Himmel Park to the UA, then De Anza Park to this current rally-only event at El Presidio Park, with a growing list of speakers (see above) and participants, including bands and entertainers. Permitting problems (and expense) prevented the marches. Celebrate Science and Earth Day tomorrow, April 22. El Presidio Park is at 175 W. Alameda by Tucson City Hall. I liked the sign “No Science No Beer.” I think we could substitute the word bread for beer and probably many others. There was such good energy at this rally-I’m sure it will continue next Saturday for the Climate March. Yes, I bet lots of the same energized people/scientists will show up next Saturday at the Climate March at El Presidio park. See you then Jenise. It did get a bit warm at the rally, but there was a very good turnout. Maybe an extra warm rally in the 3rd week of April put emphasis on the climate changes of which we speak! Yes JR, it did get a bit warm around high noon and when the Mayor started to speak. Shade was at a valuable minimum, but the crowd remained energized and upbeat. More to follow next Saturday at the Great Climate March, same place, same time. If you want the forest to be even more with you, you would encourage the release of more carbon to the atmosphere. If the current alarmist predictions for carbon levels are true, forest growth will increase by more than 20%. Propaganda, mis-information, outright lies, conspiracy theories, libel, slander, is there no level too low for you to sink, Thuck-head? 1000s of scientists & friends a this rally right now, w/ MC Fitz quoting Einstein that there are 2 infinite things: the Universe and stupidity. Lots of science themed booths to visit & learn about herpetology, dendrochronology, math & science, etc. UA Assoc. Dean of Optics Dustin Walker spoke for a fact based society, needing truth for a vision of tomorrow. Musical group Rolling Waves playing Irish jigs now and all members are scientists. Ongoing today till 2 p.m. “Science Not Silence” say a # of signs. Large Dino costume character with sign: “Donny, you’re out of your element”. Later…listened to representatives of 500 Women for Science, DeGrazia Band (son of artist Ted is guitarist), plus Amplified A Capella w/ their lively music. Mayor Rothschild encouraged the crowd to become “social scientists” and get involved in this fight for climate change. Fitz reiterated that statement saying that “more rational humans need to get involved”. Geoff Notkin, TV star, said we need “critical thinking”, that science is not “boring”, is helping to establish a science/arts/space institute and museum here in Tucson (more to come). 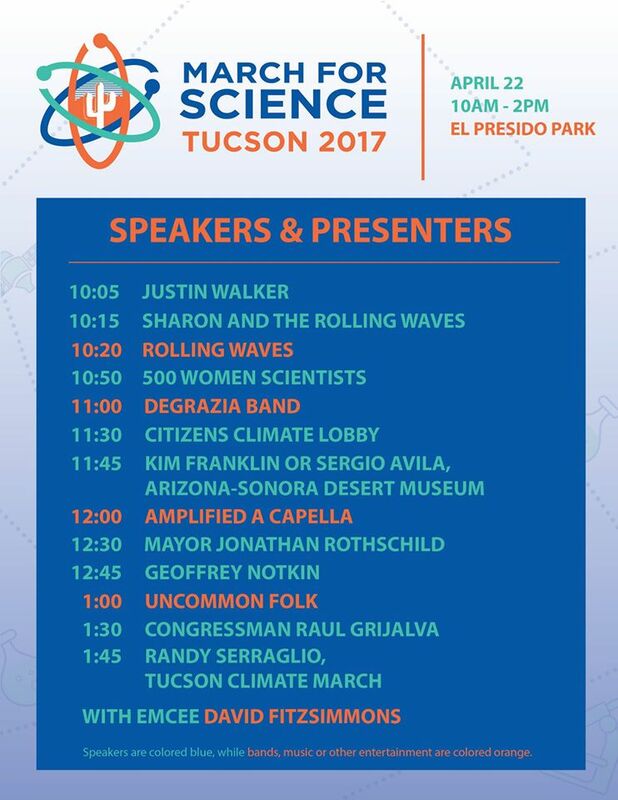 Too hot for me to stay longer at this outdoor rally…plus needed to head over to Children’s Museum for other Tucson Earth Day festival. One parting sign of the hundreds of creative ones: “May the forest be with you”.